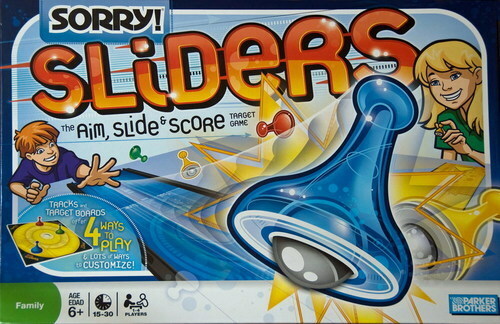 Sorry Sliders is a game marketed to children, ages 6 and up. I just played it with my three year old and she had the hang of it after the first slide. In fact, she beat me. Sorry Sliders really doesn't resemble its predecessor at all, with the exception of the logo and the little game pieces. The best way to describe it is that it's basically a board game version of curling; without the sweeping and the obnoxious shirts. Kind of like a poor man's Crokinole. Set-up is really simple and if you pay attention to the diagram, which I didn't, you can have all the pieces punched out and attached in less then five minutes. If, like me, you choose to wing it... well, you're looking at about 8 minutes once you realize you put the edges on each piece upside down and you have to pull them all off and re-attach. The nice thing about this board game is that it comes in 2, 3, and 4 player options. You just attach the coordinating number of sides and fill in the other edges with walls. That's it. Easy as pie. There are also four variations of the game so when you get bored of the first one, you can add a little challenge into the play. We played cooperatively, as I feel badly beating my three-year-old at board games. So neither of us had to say "Sorry" at any time during our game. And neither of us had to send our pieces back to home. I suspect that when I play this with my sons, there's going to be a lot more gleeful "Sorry"-ing going around as they aim to send my pieces flying of the table. Game play is super simple. Basically, you take turns sliding your tokens down the board trying to get as close as possible to the middle ring, which is worth the most points. If you managed to send an opponents piece to the edge of the tabe in the process, well, that's where the apologizing starts. The further from the ring, the lower the point count. We playing 3 rounds (12 slides each) and finished the game. Because I let my daughter score first, she won, but in reality, it's was probably at least a draw. From my perspective, it's a fun, quick little game. It's certainly not as frustrating as I remember the Sorry from our childhood to be. Don't expect to utilise any strategy as this is definitely a no-brainer. And don't bring it out to your university game night... they're just not the target audience! - Laura Freeman resides in Vanderhoof, B.C, where she is a social worker, mother of three amazing kids, soon-to-be published novelist, and all-around amazing sister! She also scrapbooks avidly and you can check out her scrappy antics at her blog Scrapbooking Beats Housework. UPDATE: 04-Jan-2012 - I may have been premature when I wrote my comments about Sorry Sliders after playing it with my daughter the other day. We pulled it out again yesterday at my five-year old’s birthday party. It scored some decent table time as each of the guests in attendance wanted to have a go at it. So, to update my opinion of the game, I thought I’d add that Sorry Sliders is much more competitive and much more fun when played as a four-player game. And tilted on an angle, it actually will fit on my kitchen table. We only used the basic board, and have yet to try any of the three variations, but despite the simple instructions, it was a ‘hoot’. Adults, unlike three-year olds, can strategize. 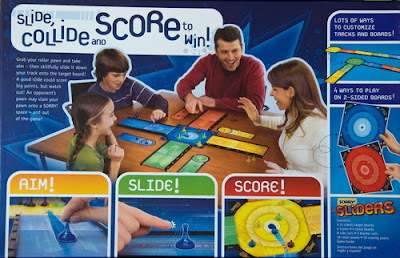 Instead of just aiming to land their sliders as close to the bulls-eye as possible, adults will aim to knock each others’ sliders out of play; Or even more cut-throat, knock them into higher scoring rings when, towards the end of the game, opponents are looking to score ones and twos to land their tokens in the home square. To my surprise, and delight, everyone enjoyed the game and got into the action. So, I guess I just want to add that this is an excellent family game as everyone will enjoy the action regardless of age or skill level. 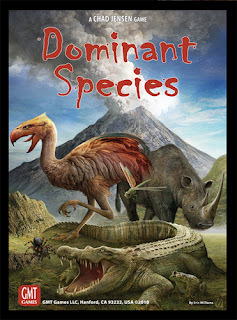 I finally got a chance to play Dominant Species, a game that seems to be at the top of a lot of 'Best Of' lists this year. And I think I can see why. 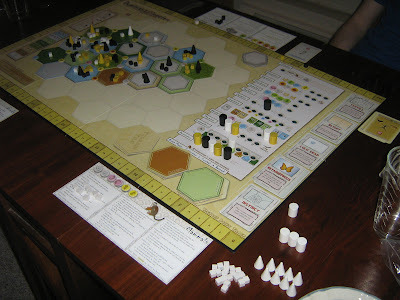 It's a rather complex worker placement game with an interesting majority placement/war gamey kind of feel. It wasn't half as complicated to learn as people make it out to be and it's actually quite enjoyable to watch your class of animals grow and adapt. However, for an almost 3 hour game, it's rather chaotic and in our game the winner seemed to be completely determined in the final round. As well, the worker placement choices seem a tad clunky. Every single round started with players filling up first the limited spaces on the Dominance (scoring) row, allowing them to choose which tile to score and which special power card to use. It seemed pretty much programmed and in a 5 or 6-player game I imagine it would be rather frustrating. Still, for a strategy game this long to hold my attention so completely despite the randomness, there's definitely something working. I won't be buying it but I'll definitely play it again. I have been aching to try the Flight Ban rules and they finally got posted on BoardGameGeek (if you haven't played the delightfully tense A:E, you can check out my description here). One major problem with Airlines: Europe (and Union Pacific before it) was the fact that none of the airlines actually ever seem to clash on the board, it was just too open and they could all be expanded quite easily. The addition of flight bans, which anyone can play with just 12 dark chips, tightens the board up nicely. After each of the first couple scoring rounds certain routes can be closed up, making it harder for airlines to reach their destinations. Very simple addition but definitely adds some complexity and interaction. Well worth it and we will not be playing this game without it again. 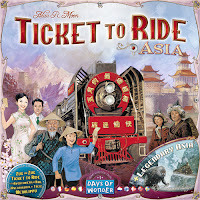 Managed to play a game of the new Ticket To Ride: Asia team expansion last night and loved it. My favourite series of games now has an option for clever partnership play and it felt quite rewarding when you worked together with someone to complete a ticket. 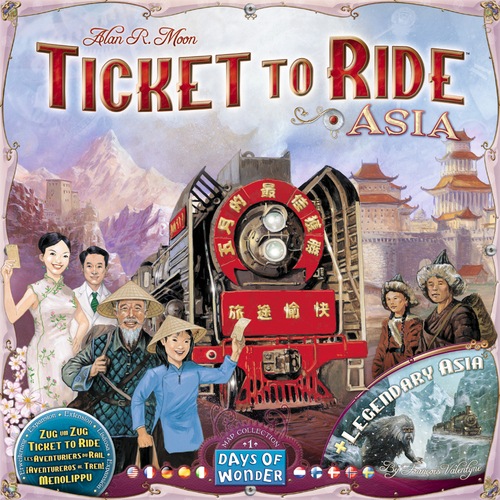 I am reminded again and again of how much I enjoy Alan R. Moon games, whether it be a game in the TTR series, the lovely Elfenland, the interactive and nasty Oasis, or the brilliant and under-rated card game Gloria Picktoria. He is the tops for me right now with Knizia, Sackson, Friese, Kramer, and Wallace following not far behind. Who is your favourite game designer and why?